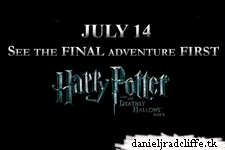 Via Harry Potter Wiki I can offer you a chance to win free tickets to see Harry Potter and the Deathly Hallows part 2 to at a pre-screening in Santa Clara. Please note that this does not include airfare or hotel accommodations. I'm giving away two tickets and each winner is allowed to bring a guest. To enter, send an e-mail to marion@danieljradcliffe.tk with the subject: HP7 screening. Make sure you add your full name.